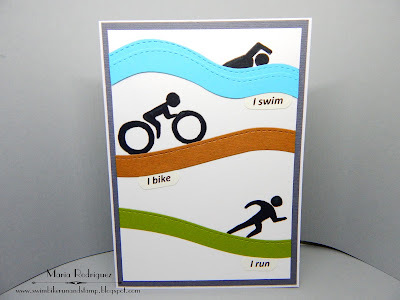 Hello dear blogging friends: I guess by now, the picture on my blog lets you know I'm a Triathlete. The Sport of Triathlon is very dear to me because I've been able to accomplish the dream of becoming an Iron Man. Some of you might not heard of this race so, without going into to much detail about it, (which I tend to do since I love it so much) the Iron Man Triathlon consists in swimming 2.4 miles in a lake or the ocean, biking 112 miles and then, running a 26.2 Marathon. The thrill of completing one of this grueling races is beyond amazing and I've done it 3 times!!!!! So, when I learned that the theme for this week's challenge over at SHOPPING OUR STASH was "SPORTS" the first one that came to my mind was Triathlon. I don't have any stamps for this sport so I had to get creative and figure out how I was going to make a card with this theme. 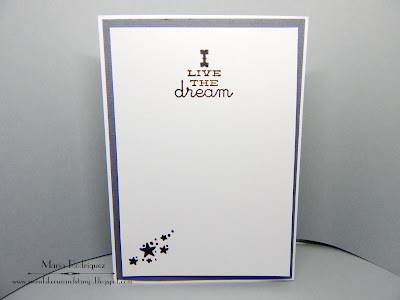 So, I went on a hunt on the net and I found THIS CARD that I used for my inspiration. I put the image of the card on my computer screen and traced the little figures onto a piece of Vellum. Then I remember I had a set of old dies with wavy designs on my stash and I thought they would be perfect for replicating the design on the card on Pinterest. After I cut the card stock with the dies, I positioned them on my watercolor paper panel to figure out where I was going to draw the figures, I then held the lines with a bit of tape and took this panel to the light box, where I traced the figures with pencil and then, fill them out with a black watercolor pencil and a small brush. The words were printed on the computer and punched out with the SU Word Window Punch. This sentiment is done using two stamp sets, the words are from an old Flourishes set called "Old Fashioned Florals" and the stars are from a Fiskars "Graduation" set. So, whether you have some sport stamps in your stash or not, we hope you get creative and come and join us in the SHOPPING OUR STASH gallery, we can't wait to see what you make. Hello dear friends: My teammates and I at THE FLOWER CHALLENGE, have a new and fun and not to often used technique for you to have some real fun with. We are talking about PAPER PIECING which should NOT be confused with PAPER PIERCING, ok? So here is the card I made to inspire you to come and play along with us in our gallery. I used some of my beloved, one sided pattern paper scraps from Lili of the Valley, this line of papers is sadly discontinued but, I was lucky enough to grab about 10 fabulous, 8x8 paper pads with the most beautiful colors and designs. 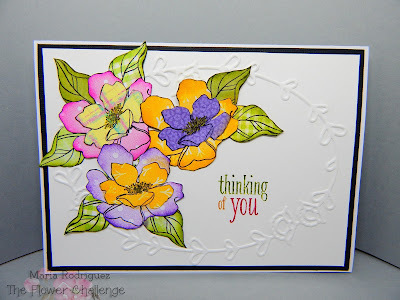 So I stamped my flowers from the retired Stampin' Up! 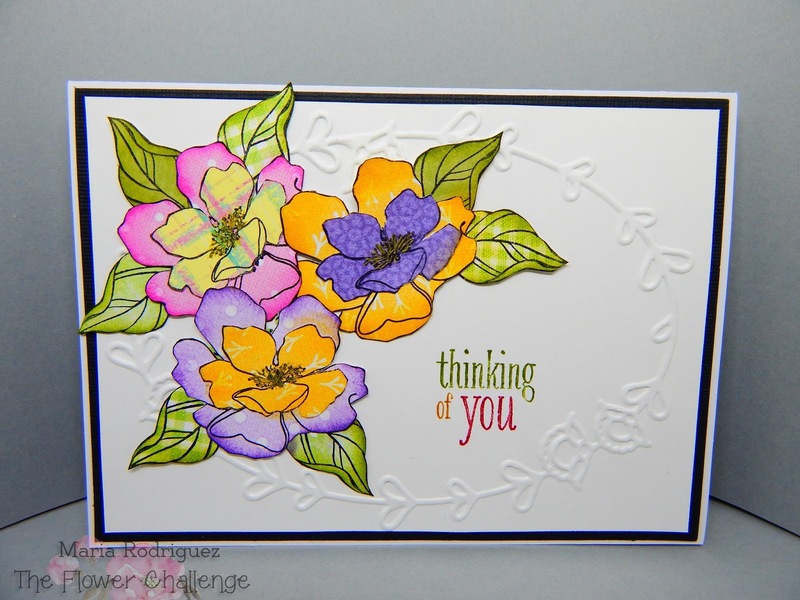 set called "Fabulous Florets" and the leaves, from another retired SU set called "Peaceful Petals with Stazon black in onto the paper scraps and then, fussy cut them. I sponged a bit of distress inks one each of the pieces and arranged them on my embossed panel, the sentiment is from the Peaceful Petals set. This is the finished inside of my card. I used one of the leftover flowers and leaves I fussy cut to embellish the inside, the sentiment is from a retired Flourishes set called "Dahlias". 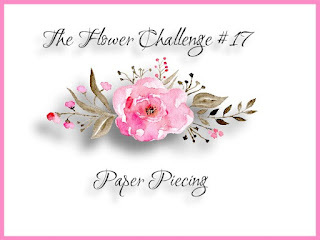 So, there you have it, I hope you feel inspired to join my teammates and I in THE FLOWER CHALLENGE gallery, we can't wait to see what you create. For more inspiration, go to the blog and check out what the rest of the Designer Team created, you'll be glad you did. Please include our banner when you upload your card and don't forget to read our rules, they are few but important. 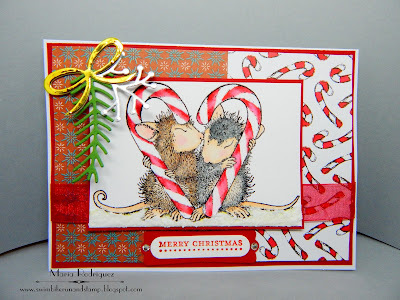 Hello everyone: I have the joy to be a Guest Designer for the HOUSE MOUSE AND FRIENDS MONDAY CHALLENGE and this is my second contribution to it. If you want to you can see my first card HERE and the card that won me this DT spot HERE. 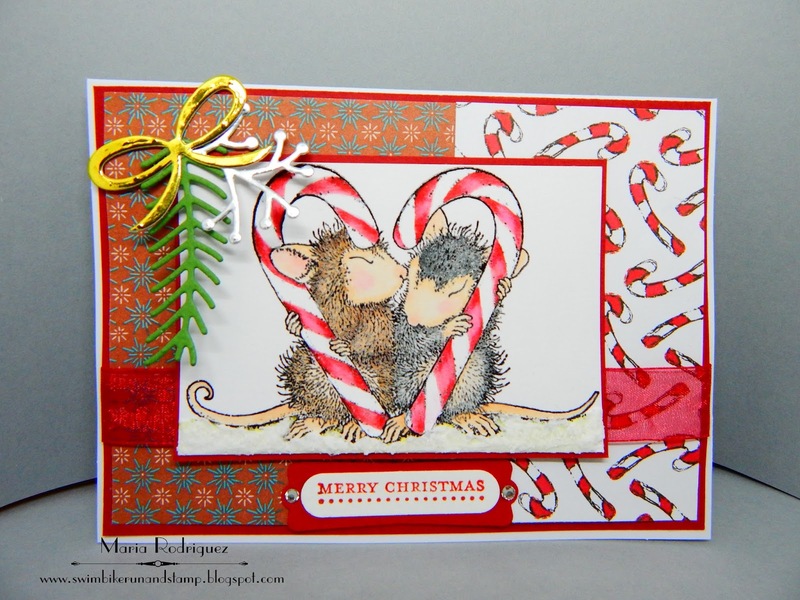 It's no secret that I adore this little critters so, being a part of this challenge blog is simply fabulous. Here is my card for today, February 5th. challenge which is "Anything Goes with an option Challenge Theme of SWEETS OR HEARTS"
This image is called "Candy Gram", isn't it just the sweetest? I stamped it on watercolor paper with Versafine black ink and clear heat emboss it then, colored the brown mousy with some very old Derwent watercolor pencils, I really love the brown colors on this set. The black little mousy is colored with a SU black marker as well as the candy canes. The pine branch details is done with the retired SU die set called "Pretty Pines", the pattern papers and the ribbon, are from my stash. 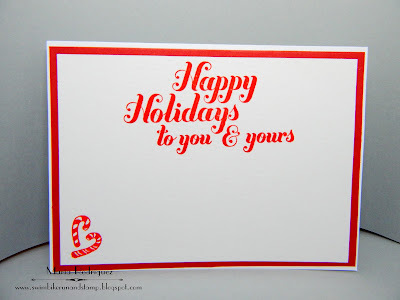 The sentiment is from another retired SU set called "Joy to the World", the candy canes on the bottom corner are from a Power Poppy set called MERRY LITTLES. 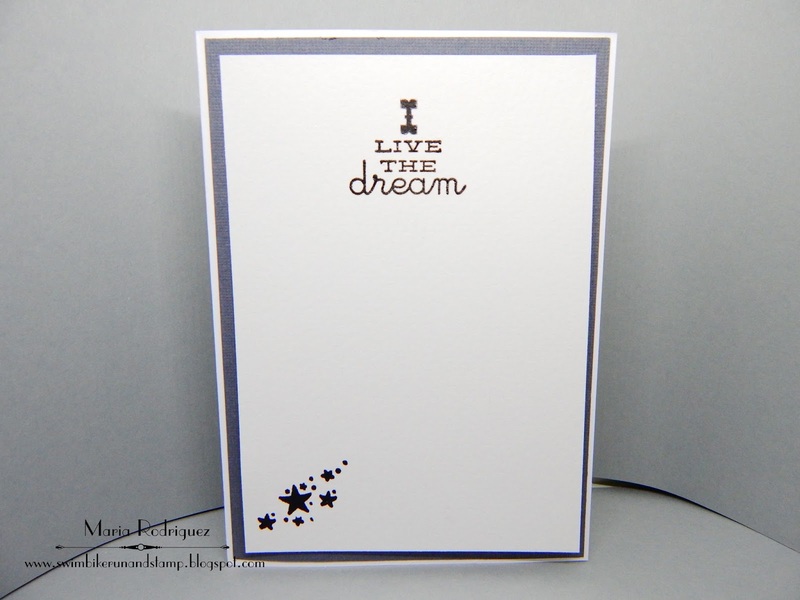 I hope I inspired you to come and join the party at the HOUSE MOUSE AND FRIENDS MONDAY CHALLENGE, for more inspiration, take a look at the amazing and beautiful creations of the rest of the Designer Team.